Less than four months after his inauguration, President Garfield arrived at the Washington railroad depot on July 2, 1881, to catch a train for a summer's retreat on the New Jersey seashore. 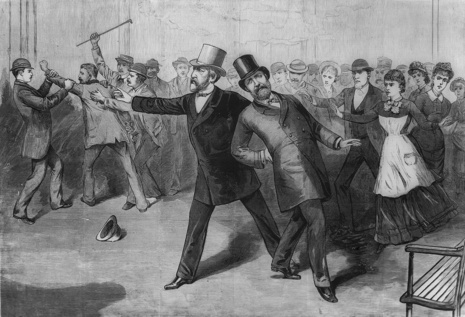 As Garfield made his way through the station, Charles Guiteau raced from the shadows and fired two shots point blank into the president. One grazed Garfield's arm; the other lodged in his abdomen. Exclaiming, "My God, what is this?" the president collapsed to the floor remaining fully conscious, but in a great deal of pain. 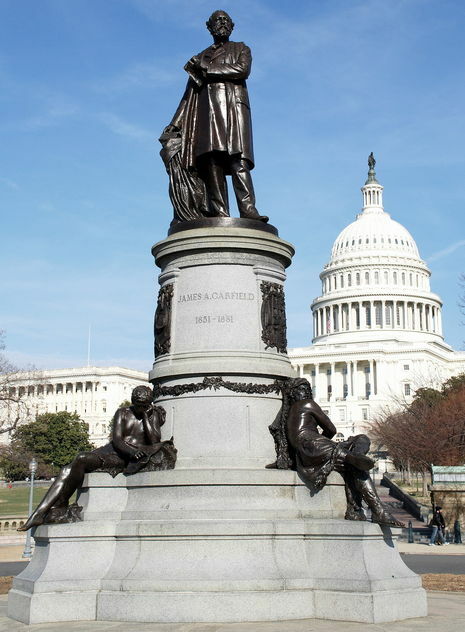 James Abram Garfield (November 19, 1831 – September 19, 1881) was the 20th President of the United States. 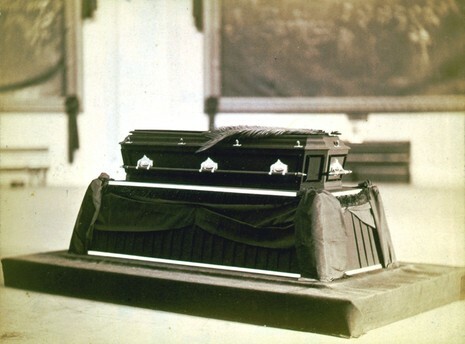 His death, two months after being shot and six months after his inauguration, made his tenure the second shortest (after William Henry Harrison) in United States history. He was shot by Charles J. Guiteau, disgruntled by failed efforts to secure a federal post, on July 2, 1881, at 9:30 a.m. The President had been walking through the Sixth Street Station of the Baltimore and Potomac Railroad (a predecessor of the Pennsylvania Railroad) Washington, D.C., on his way to his alma mater, Williams College, where he was scheduled to deliver a speech, accompanied by Secretary of State James G. Blaine, Secretary of War Robert Todd Lincoln (son of Abraham Lincoln) and two of his sons, James and Harry. The station was located on the southwest corner of present day Sixth Street Northwest and Constitution Avenue in Washington, D.C., a site that is now occupied by the National Gallery of Art. As he was being arrested after the shooting, Guiteau repeatedly said, "I am a Stalwart of the Stalwarts! I did it and I want to be arrested! Arthur is President now!" which briefly led to unfounded suspicions that Arthur or his supporters had put Guiteau up to the crime. One bullet grazed Garfield's arm; the second bullet lodged in his spine and could not be found, although scientists today think that the bullet was near his lung. Alexander Graham Bell devised a metal detector specifically for the purpose of finding the bullet, but the metal bed frame Garfield was lying on made the instrument malfunction. Because metal bed frames were relatively rare, the cause of the instrument's deviation was unknown at the time. Garfield became increasingly ill over a period of several weeks due to infection, which caused his heart to weaken. He remained bedridden in the White House with fevers and extreme pains. In early September, the ailing President was moved to the Jersey Shore in the vain hope that the fresh air and quiet there might aid his recovery. In a matter of hours, local residents put down a special rail spur for Garfield's train; some of the ties are now part of the Garfield Tea House. The beach cottage Garfield was taken to has been demolished. Most historians and medical experts now believe that Garfield probably would have survived his wound had the doctors attending him been more capable. Several inserted their unsterilized fingers into the wound to probe for the bullet, and one doctor punctured Garfield's liver in doing so. This alone would not have brought about death as the liver is one of the few organs in the human body that can regenerate itself. However, this physician probably introduced Streptococcus bacteria into the President's body and that caused blood poisoning for which at that time there were no antibiotics. One such example of the press taking over the job of finding the answer as to finding the exact location of the bullet took place one week after the shooting. Simon Newcomb of Baltimore was interviewed by a reporter for the Washington National Intelligencer. Newcomb had been experimenting with running electricity through wire coils and the effect metal had when placed near the coils. He had found that when metal was placed near the coils filled with electricity that a faint hum could be heard at that point in the coil. The problem was that the hum was so faint that is was very difficult to hear. He suggested that he might be able to perfect his invention so that it could be used on the President but, unfortunately, he though that the perfection of the apparatus would take too long. While in Boston, Alexander Graham Bell read the newspaper account mentioned in the above paragraph of this article. Upon reading this account, Bell telegraphed Newcomb in Baltimore and offered to assist him. Further, he suggested that perhaps his own invention of the telephone was the answer he had been seeking. His telephone amplified sound made through wire! Newcomb accepted Bell's offer. Bell immediately went to Baltimore to work with Newcomb. White House surgeons spent a lot of time at the Baltimore lab witnessing the experiments. The invention consisted of two coils of insulated wire, a battery, a circuit breaker, and Bells' telephone. The ends of the primary coil were connected to a battery and those of the secondary coil were fastened to posts of the telephone. When a piece of metal was placed in the spot where the circuit breaker was, a hum could be heard in the telephone receiver. As the metal was moved further away, the hum became more faint. Five inches away was the maximum distance that a hum could still be heard.